In today's data-driven world, organizations of all sizes are at risk for a cyber-attack or data breach. It's not a question of if your clients' organization will suffer a breach, but when. Just one stolen laptop, one resourceful hacker, one virus or even one lost paper record of customer data or your company's financial records can create enormous financial and reputational consequences. Network & Information Security Liability - Coverage for claims arising from unauthorized access to data, failure to provide notification of a data breach where required by law, transmission of computer virus or failure to provide authorized users with access to the company website. Communications & Media Liability - Coverage for claims arising from copyright infringement, plagiarism, defamation, libel and slander in electronic content. Crisis Management Event Expenses - Coverage for public relations services to mitigate negative publicity. Security Breach Remediation & Notification Expenses - Coverage for costs associated with notification of individuals breached, credit monitoring, fraud expense reimbursement and call center. Optional per person notification available. Computer Program & Electronic Data Restoration Expenses - Coverage for expenses to restore data lost from system damage due to computer virus or unauthorized access. Funds Transfer Fraud - Coverage for loss of money or securities due to fraudulent transfer instructions to a financial institution. E-Commerce Extortion - Coverage for money paid as a result of threats made to fraudulently transfer funds, destroy data, introduce a virus, attack a system or disclose electronic customer information. Business Interruption & Expenses - Coverage for loss of income and expenses to restore operations as a result of a computer system disruption caused by a virus or unauthorized computer attack. Computer Fraud - Coverage for loss of money, securities or other property due to unauthorized system access. CyberRisk can be obtained singly or as part of Wrap+ for Executive Liability for Private Companies. You can pick and choose the coverages your client needs and leave off what they don't. In the future you can add new or drop old coverage as needed. As part of the coverage, your clients receive access to Risk Management Plus+ Online®, a one-stop resource that provides a comprehensive set of tools to help protect their organization from costly litigation. To learn more, visit www.rmplusonline.com. To access the Wrap+ please log into Big "I" Markets and look for Wrap+ products in the commercial product listing. Please note that Community Homeowners Associations and Healthcare Organization are not currently available through Big "I" Markets. What's better than getting a full-size bar of candy on Halloween? Getting a bigger, sweeter commission check! Big "I" Markets is excited to announce that for any affluent account bound with AIG or Chubb via new business (or received via BOR) with an effective date between 10/31/17 and 12/31/17, your agency will receive 75% of the commission Big "I" Markets receives. This is an increase from 60% or 66% and will remain in force until the policy renews, at which time it will reset to your agency default. Please contact your affluent underwriter today with how they can help secure the account. For questions on commission, please contact Aimee Fawns. Happy Halloween! We hope you haven't eaten too much candy to read up on a few spooky resources from your association. First, read up on (and post on social media to share with your clients!) 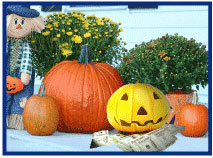 IA Magazine's 11 Tips for a Safe Halloween. 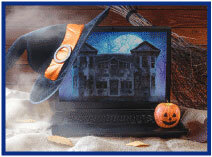 Then give yourself a spooky scare by visiting E&O Happens to review some insurance agency E&O claim examples. To make sure you're able to sleep tonight, go ahead and review some claims prevention resources while you're there. Next, creep over to the Caliper blog to read about "Unmasking the Real Job Applicant"-and how using a Caliper profile helps you hire the right person the first time. Finally sneak over to the DocuSign blog to read up on magic spells for common signature scares. Here are some Halloween tidbits with which to impress your officemates. The origin of Halloween can be traced back to the Celts, a tribe that resided in Ireland and Northern France. The Celts first celebrated Samhain (Pronounced SAH-win or SOW-in) around 4000 B.C. around the last day of what would become October as it marked the end of summer and the beginning of winter. The Celts believed the dead would visit them, so they left food and drink outside their homes for them. The ancient Celts also thought that spirits and ghosts roamed the countryside on Halloween night. They began wearing masks and costumes to avoid being recognized as human. Famous and mysterious magician Harry Houdini died on Halloween in 1926. One way to supposedly deter a vampire is to throw seeds (usually mustard) outside a door or place fishing net outside a window. Vampires are compelled to count the seeds or the holes in the net, delaying them until the sun comes up. Dolley Madison planted the original Rose Garden at the White House. Years later during Woodrow Wilson's term his wife decided to remove this garden. Dolley's ghost appeared before the workman assigned the task and demanded they stop. They fled and the Rose Garden remains, in place, today. Candy Corn was invented by George Renninger, a candy maker at the Wunderle Candy Company of Philadelphia in the 1880s. Candy Corn was originally called "butter cream candies" and "chicken feed" because corn was commonly used as food for livestock. They even had a rooster on the candy boxes. Candy Corn had no association with Halloween or fall, and was sold seasonally from March to November. After World War II, advertisers began marketing it as a special Halloween treat due to its colors that match those of the fall harvest. Lastly, what do you get if you divide the circumference of a jack-o'-lantern by its diameter? Pumpkin Pi! Happy Halloween! David Tralka "Don’t Get Left Behind in a Rising Rate Environment"
Congratulations to our agent in Georgia on a Performance Bond sale of $51,670 in premium!